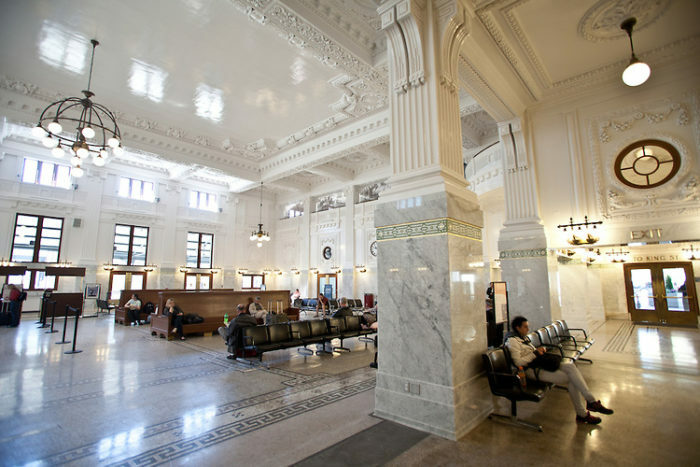 VANCOUVER, B.C.–When I arrived at Seattle’s King Street Station this morning, I knew there had been a mudslide to the south that was disrupting Amtrak service. Both Amtrak Cascades trains and the Coast Starlight were affected. Still, the line-up of buses outside the station seemed like more that would be needed to haul passengers around the mess. That was my first clue. The second came as I was walking into the waiting area and heard someone ask a conductor which was the bus going to Vancouver. The conductor replied, “Vancouver, Washington, or Vancouver, B.C”? Yes, there had indeed been yet another mudslide, this one north of Seattle. Fortunately, we were bused only as far as Everett, Washington, which took us around the blocked stretch of track — a 45-minute bus ride instead of four-plus hours. All things considered, the Amtrak people there did a terrific job getting it all figured out and organized. But imagine the hassle! You have to bus several hundred people around one mudslide and then, unexpectedly, another one happens and another four buses have to be found and brought to King Street Station ASAP. They had a three-car train waiting for us in Everett–two Superliner coaches and a Sightseer Lounge Car–and we all got to Vancouver, BC, less than 20 minutes after we would have arrived on a normal “mudless” day. Later, after I had cleared Canadian Customs and Immigration at the Vancouver station, I stopped at the VIA Rail counter to ask the woman there when I should be back for Train #2. The train departs tonight at 8:30, but VIA personnel show up around 6:45 to check passengers in and assign seating times for dining car meals. That’s when I’ll be back, because late arrivals end up dining at what could be odd hours. There won’t be internet access once we depart this evening, although there may be an opportunity to post something from the station when we stop in Winnipeg. For sure the next post will be Tuesday from Toronto. Photos, too. Now a sort nap . . . a shower and shave . . . and back to the station to check in for Train #2. Previous Maui to Washington in 10 Days.